This book was deaccessioned from the Palm Beach County Library in Florida. 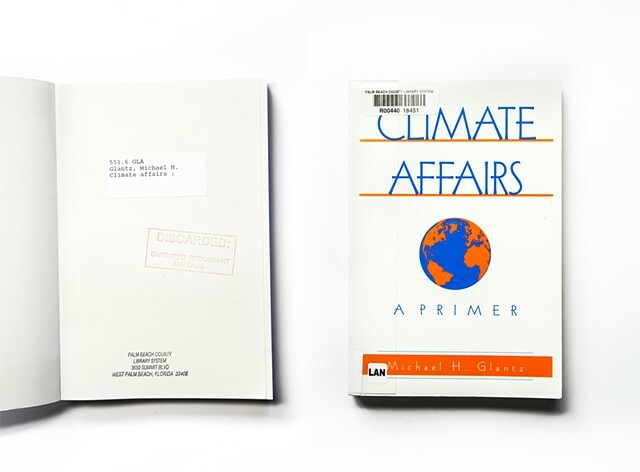 The publisher's summary reads: "Climate Affairs sets forth in a concise primer the base of knowledge needed to begin to address questions surrounding the unknown impacts of climate change. In so doing, it outlines a new approach to understanding the interactions among climate, society, and the environment." In June of 2017, Palm Beach, which like other locales in southern coastal Florida is severely threatened by the increased force and occurrence of storms, spreading tropical diseases and rising sea levels brought on by climate change, created an "Office of Resilience" to help deal with these approaching threats.